Talking Heads' "Stop Making Sense" is still one of the best concert films of all. Jonathan Demme captured (or reconstructed?) an energy and suspense that rarely sits still long enough to be filmed. 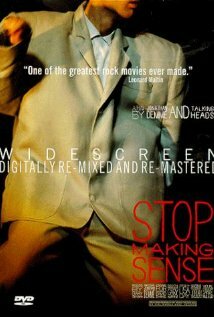 If you've never seen "Stop Making Sense" you are not getting the most out of your summer. Patrick Barlow is the producer trying to pull this recording session together. Jennifer Saunders and Dawn French are flawless, as usual. One more Patrick Barlow reference for the month. Barlow is the producer trying to pull this recording session together. Jennifer Saunders and Dawn French are flawless, as usual. Or their version of flawless, at least. Listen to Clement C. Moore and Irving Berlin discuss their Christmas classics in a stimulating and sometimes even coherent interview. Listen to Clement C. Moore and Irving Berlin discuss their Christmas classics in a stimulating and sometimes even coherent interview. Download the podcast at iTunes or at the Dead Authors Podcast site. The holidays come to life as more than 100 regional tuba, sousaphone, and euphonium players join together to perform holiday classics for all ages!